A PLAN of the Streets in the united Parishes of ST. MARGARET & ST. JOHN THE EVANGELIST, Westminster. From a Survey made by I.H. Taylor. No. 22 PARLIAMENT STREET 1828.
bl.uk > Online Gallery Home	> Online exhibitions	> Crace Collection of Maps of London	> A PLAN of the Streets in the united Parishes of ST. MARGARET & ST. JOHN THE EVANGELIST, Westminster. From a Survey made by I.H. Taylor. No. 22 PARLIAMENT STREET 1828. 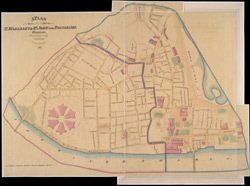 Plan of the parishes of St Margaret's, outlined in blue line, and St James', delineated in pink, Westminster. A thin red line shows the boundary of the Tothill Fields District. The large 6-petal structure depicted at lower left is Millbank Penitentiary, built in response to requests for prison reform and finally completed in 1821.